HomeVocabThe Hindu Vocab 17th September 2018 For Competitive Exams. The Hindu Vocab 17th September 2018 For Competitive Exams. 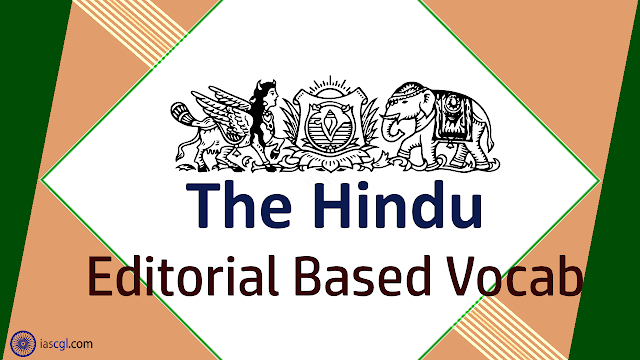 Vocabulary from The Hindu Editorial 17th September 2018 for Staff Selection Commission(SSC) Combined Graduate Level, Combined Higher Secondary Level, Bank PO, Clerk and other state Government Examination. Synergises: सहक्रिया - to combine or work together in order to be more effective, or to make things or people do. Signatory: हस्ताक्षरकर्ता - a party that has signed an agreement, especially a country that has signed a treaty. Envisages: परिकल्पना की गई है - contemplate or conceive of as a possibility or a desirable future event. Mitigation: शमन - the action of reducing the severity, seriousness, or painfulness of something. Conflicts: संघर्ष - a serious disagreement or argument, typically a protracted one. Cater: पूरा - provide food and drink, typically at social events and in a professional capacity. Reservoir: जलाशय - a large natural or artificial lake used as a source of water supply. Rhetoric: वक्रपटुता - the art of effective or persuasive speaking or writing, especially the use of figures of speech and other compositional techniques. The Hindu Vocabulary is very useful for us to preparing ssc cgl competitive exam. Thank you very much sir.